So, my girlfriend does not necessarily believe in Magic but she is superstitious. That means she has respect for something that may exist and work in some way and you never know anyways. She also has a little misconception about the Magic I am practicing when she asks me now and then whether I could not perform a ritual to get something she needs or wants etc. However, she has a few issues going on for which she needed help. One thing was that she needed to win a law suit which would guarantee some payments she is entitled to. She went to my magical supply store and got a green candle with a little ritual advise. The candle was supposed to burn for a few days and so she needed to do a little focussing every evening. She won the case, so far so good. There is another thing going on where someone wants to get something from her so she could loose some property. So she went again. This time she got a different candle. Chango or Shango, orange/white. The woman in the store told her that Chango is a very good looking dude, that he likes orange and that she needs to put some orange things next to the candle. He also would like carrots, corn and other stuff she should put. Oh, and flowers. I am sorry if I am mixing up things now but I really have no real idea about Yoriba and Orishas. 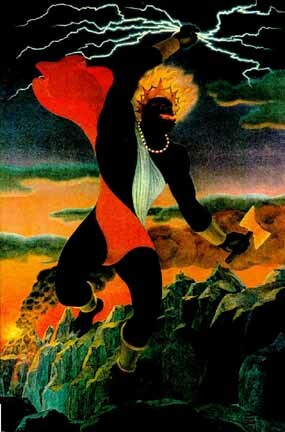 It seems that this Chango is an Orisha, a god or so whose equivalent in Santeria is St. Barbara. He is related with war. I read some stuff and he seems to be demanding and it also said you should not mess with him. Now, whatever may be behind this, as I said, I am far away from having much knowledge here, why on earth would someone advise a Magical ritual for someone which is clearly linked to a specific religion and/or tradition, when that person has no idea about the religion/tradition and the context the ritual or specifically the forces used stand in? It is a bit like someone performing Solomonic Magic or necromancy without any background and preparation just because he is bored. I do not know if also in this case things can go wrong but we know that some forces need to be treated in the right way. I tried to make her go and get another “simple” candle but she does not want (I believe it is the imagination of a very good looking guy with a battle axe is too appealing). At the end of the day I told her not to think too much about the background of Chango but to focus on what she wants him to do (win the case and keep her property). Personally I believe that most rituals do not work if you do not have at least a basic understanding about the ritual and its various components and the context/tradition it has to be seen in. Of course some rituals do have effects even without that while opening the subconscious and working there. But here you ask for something specific, want some force to work in your favour. Maybe I am too naive or missing the point but I hope that this will go well and does not have any unwanted side effects….. But what do you think? 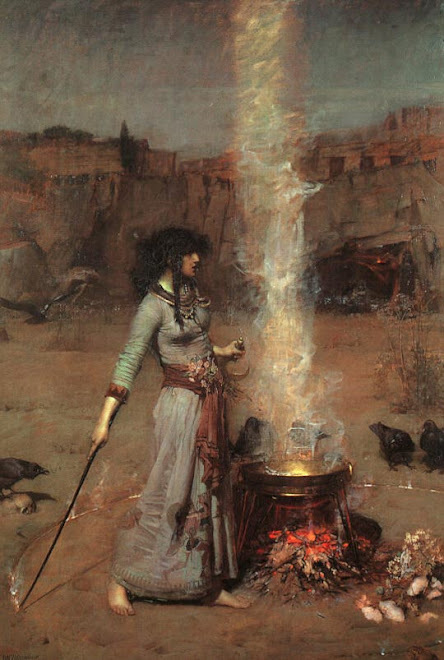 Is it ok to advise someone to use rituals including deities which are totally unknown to the person, deities or forces which are from a religious (or Magical) tradition about which nothing is known to that person? I think it can be dangerous yes, but also useful. I would point to the use of the Egyptian (Coptic-named) godforms of the GD as an example. Harparkrat was not actually a "god of silence," but a version of the childlike version of the god Horus. Nevertheless, an entirely new meaning grew out of Roman/Greek understanding of the god's posture, and from there, the GD used the form as its own. Of course the god's "egregore" was transformed over many years into something new, but Egyptian purists would (and still do) look with disdain upon the misappropriation of the god's meaning. Bottom line for me is that using another's god/ess for a ritual doesn't mean disaster - the gods seem pretty flexible when it comes to appropriation. Not to say that you could necessarily use a Hebrew God-name to invoke Satan, but that's exactly what LaVey's CoS did. Whether it works or not, I believe it comes down to intent. Thanks for the post, interesting stuff! Thanks Fr. Aene. I am with you thzere that it can be useful. I still believe that in such cases one would have to know what one is doing. Just as you say, somethign may be taken and transformed into one's own use. In this case however, someone who has no concept of any gods and just a very vague idea about her own faith (rather based on superstition), I am not sure. I think someone like that could mix things and that may have an unwanted effect - or none at all haha. But then you are right, at then end, true intent and devotion to the ritual are key.